Marquis of Lothian against Haswell & al. 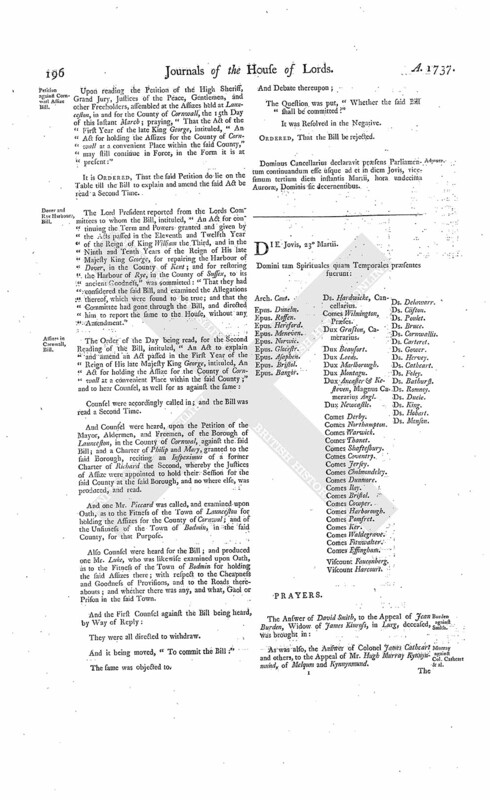 The joint and several Answer of John Haswell, present Provost of the Borough of Jedburgh, and others, to the Appeal of William Marquis of Lothian and others, was brought in. His Majesty, being seated on the Throne, adorned with His Crown and Regal Ornaments, and attended with His Officers of State; the Lords being also in their Robes; commanded the Gentleman Usher of the Black Rod to let the Commons know, "It is His Majesty's Pleasure, that they attend Him immediately, in this House." "2. An Act for repairing the Road leading from the Trent Bridge, in the County of the Town of Nottingham (through Costock otherwise Cortlingstock Lane) to the Bridges commonly known by the Name of Cotes Bridges, in the County of Leicester." "3. An Act for laying a Duty of Two Pennies Scots, or One Sixth Part of a Penny Sterling, upon every Scots Pint of Ale and Beer which shall be brewed for Sale, brought into, vended, tapped, or sold, within the Town of Aberbrothock, and Liberties thereof." "4. An Act for naturalizing Abraham Blydesteyn." With a Bill, intituled, "An Act for the more effectual securing the Payment of Rents, and preventing Frauds by Tenants;" to which they desire the Concurrence of this House. 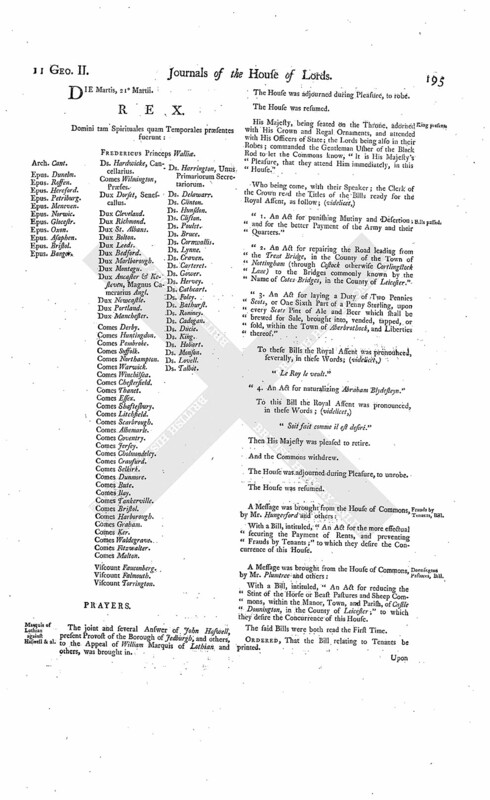 With a Bill, intituled, "An Act for reducing the Stint of the Horse or Beast Pastures and Sheep Commons, within the Manor, Town, and Parish, of Castle Donnington, in the County of Leicester;" to which they desire the Concurrence of this House. Ordered, That the Bill relating to Tenants be printed. Petition against Cornwall Assize Bill. Upon reading the Petition of the High Sheriff, Grand Jury, Justices of the Peace, Gentlemen, and other Freeholders, assembled at the Assizes held at Launceston, in and for the County of Cornwall, the 15th Day of this Instant March; praying, "That the Act of the First Year of the late King George, intituled, "An Act for holding the Assizes for the County of Cornwall at a convenient Place within the said County," may still continue in Force, in the Form it is at present:"
It is Ordered, That the said Petition do lie on the Table till the Bill to explain and amend the said Act be read a Second Time. Dover and Rye Harbours, Bill. The Lord President reported from the Lords Committees to whom the Bill, intituled, "An Act for continuing the Term and Powers granted and given by the Acts passed in the Eleventh and Twelfth Year of the Reign of King William the Third, and in the Ninth and Tenth Years of the Reign of His late Majesty King George, for repairing the Harbour of Dover, in the County of Kent; and for restoring the Harbour of Rye, in the County of Sussex, to its ancient Goodness," was committed: "That they had considered the said Bill, and examined the Allegations thereof, which were found to be true; and that the Committee had gone through the Bill, and directed him to report the same to the House, without any Amendment." Counsel were accordingly called in; and the Bill was read a Second Time. And Counsel were heard, upon the Petition of the Mayor, Aldermen, and Freemen, of the Borough of Launceston, in the County of Cornwal, against the said Bill; and a Charter of Philip and Mary, granted to the said Borough, reciting an Inspeximus of a former Charter of Richard the Second, whereby the Justices of Assize were appointed to hold their Session for the said County at the said Borough, and no where else, was produced, and read. And one Mr. Piccard was called, and examined upon Oath, as to the Fitness of the Town of Launceston for holding the Assizes for the County of Cornwal; and of the Unfitness of the Town of Bodmin, in the said County, for that Purpose. Also Counsel were heard for the Bill; and produced one Mr. Luke, who was likewise examined upon Oath, as to the Fitness of the Town of Bodmin for holding the said Assizes there; with respect to the Cheapness and Goodness of Provisions, and to the Roads thereabouts; and whether there was any, and what, Gaol or Prison in the said Town. And it being moved, "To commit the Bill:"
The Question was put, "Whether the said Bill shall be committed?" Ordered, That the Bill be rejected. Dominus Cancellarius declaravit præsens Parliamentum continuandum esse usque ad et in diem Jovis, vicesimum tertium diem instantis Martii, hora undecima Auroræ, Dominis sic decernentibus. Murray against Col. Cathcart & al. As was also, the Answer of Colonel James Cathcart and others, to the Appeal of Mr. Hugh Murray Kynnynmund, of Melqum and Kynnynmund. All Saints Church at Worcester, to re-build, Bill. The Earl of Shaftesbury reported from the Lords Committees to whom the Bill, intituled, "An Act for taking down and re-building the Church of the Parish of All Saints, in the City of Worcester," was committed: "That they had considered the said Bill, and examined the Allegations thereof, which were found to be true; and that the Committee had gone through the Bill, and directed him to report the same to the House, without any Amendment". His Lordship also reported from the Lords Committees to whom the Bill, intituled, "An Act to enable Trustees to grant Building Leases of certain Messuages, in the Parishes of Saint Martin in the Fields and Saint Clement Danes, in the County of Middlesex, late the Estate of Henry May Esquire, deceased," was committed: "That they had considered the said Bill; and examined the Allegations thereof, which were found to be true; that the Parties concerned had given their Consents; and that the Committee had gone through the Bill, and made some Amendments thereunto." Hodie 3a vice lecta est Billa, intituled, "An Act for continuing the Term and Powers granted and given by the Acts passed in the Eleventh and Twelfth Year of the Reign of King William the Third, and in the Ninth and Tenth Years of the Reign of His late Majesty King George, for repairing the Harbour of Dover, in the County of Kent; and for restoring the Harbour of Rye, in the County of Sussex, to its ancient Goodness." The Lord Bishop of St. Asaph reported from the Committee to whom the Bill, intituled, "An Act for naturalizing Philip Rigail," was committed: "That they had examined the Allegations of the Bill, which they found to be true; and that the Committee had gone through the Bill, and directed him to report the same to the House, without any Amendment." Brunink & al. Nat. Bill. His Lordship also reported from the Committee to whom the Bill, intituled, "An Act for naturalizing John Justin Bruningk, Peter Untzellman, and Henry Klencke," was committed: "That they had examined the Allegations of the Bill, which they found to be true; and had considered the Petitions of several Persons to be added thereunto, referred to the Committee; and that the Committee had gone through the Bill, with several Amendments." Berrington Lessee of Dormer against Packhurst & al. in Error. And John Parkhurst, Catherine Dormer, and others, are Defendants. Hodie 3a vice lecta est Billa, intituled, "An Act for exchanging Part of the Glebe Lands and Hereditaments belonging to the Rector of Stratford Toney, in the County of Wilts, for other Lands belonging to the Lord of the Manor." Hodie 2a vice lecta est Billa, intituled, "An Act for enclosing and dividing the Common Fields and Common Grounds, in the Manor and Parish of Binbrooke, in the County of Lincoln." Their Lordships, or any Five of them; to meet on Friday the 7th Day of April next, at the usual Time and Place; and to adjourn as they please. Hodie 1a vice lecta est Billa, intituled, "An Act for confirming the Sale of the Leasehold Estate late of Barnaby Cole Gentleman, deceased; and for vesting his Freehold Estate in Trustees, to be sold, for Payment of his Debts." Marquis of Lothian & al. against Haswell & al. The House being moved, "That a Day may be appointed, for hearing the Cause wherein William Marquis of Lothian and others are Appellants, and John Haswell and others Respondents:"
It is Ordered, That this House will hear the said Cause, by Counsel, at the Bar, the First Cause-day after the approaching Recess. The like Motion and Order, for hearing the Cause wherein Hugh Murray, Kynnynmound, Advocate and others are Appellants, and Colonel James Cathcart and Mrs. Elizabeth Rochead Respondents, the Second Day after the Recess. Hodie 2a vice lecta est Billa, intituled, "An Act for reducing the Stint of Beast Pastures and Sheep Commons, within the Manor, Town, and Parish, of Castle Donnington, in the County of Leicester." May, Leave for a Bill to take the Name of Knight. It is Ordered, That the Petitioner have Leave to exhibit a Petition, as desired, for the Purposes aforesaid, notwithstanding the Time limited for receiving Petitions is now expired. Dominus Cancellarius declaravit præsens Parliamentum continuandum esse usque ad et in diem Lunæ, vicesimum septimum diem instantis Martii, hora undecima Auroræ, Dominis sic decernentibus. Sir H. Dalrymple against Sir A. Hamilton. The Answer of Sir Alexander Hamilton Baronet, to the Appeal of Sir Hew Dalrymple Baronet, was brought in. Hodie 3a vice lecta est Billa, intituled, "An Act for confirming the Sale of the Leasehold Estate late of Barnaby Cole Gentleman, deceased; aud for vesting his Freehold Estates in Trustees, to be sold, for Payment of his Debts." Their Lordships, or any Five of them; to meet on Tuesday the 11th Day of April next, at the usual Time and Place; and to adjourn as they please. The Lord President reported from the Lords Committees to whom the Bill, intituled, "An Act for vesting certain Lands and Hereditaments, in the Kingdom of Ireland, Part of the settled Estate of Richard Earl of Burlington and Cork, in Trustees, to be sold, for Payment of Debts; and for settling other Lands and Hereditaments, of greater Value, to the same Uses," was committed: "That they had considered the said Bill, and examined the Allegations thereof, which they found to be true; that the Parties concerned had given their Consents; and that the Committee had gone through the Bill, and directed him to report the same to the House, without any Amendment." 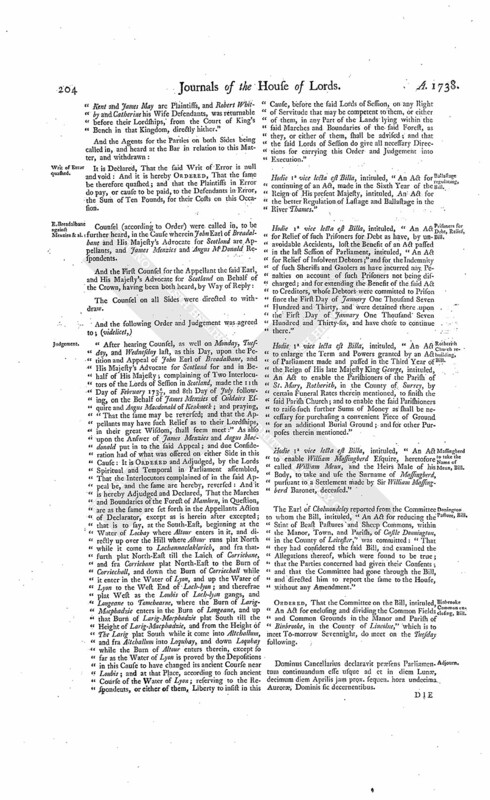 Hodie 1a vice lecta est Billa, intituled, "An Act to enable the Guardian of Amy Symes and Catherine Symes, Infants, to join in making Leases of Lands, in the Counties of Somerset and Devon, with the Owners thereof, during the Minority of the said Infants." Buchan, Time to answer Sir Hew Dalrymple's Appeal. A Petition of Robert Garden Gentleman, Agent for Mary Buchan Spinster, One of the Respondents to the Appeal of Sir Hew Dalrymple Baronet, was presented, and read; setting forth, "That she is advised, that the Matter in Question between the Parties cannot be determined by this House, as to the Petitioner, but upon a Cross Appeal;" and praying, "That she may have a Fortnight's further Time to put in a Special Answer." Ordered, That the said Mary Buchan do peremptorily put in her Answer to the said Appeal in a Fortnight. Counsel (according to Order) were called in, to be heard, in the Cause upon an Appeal of John Earl of Breadalbane, and His Majesty's Advocate for Scotland, for and on Behalf of His Majesty; to which James Menzies of Culdairs Esquire and Angus McDonald of Kenknock are Respondents. The Counsel on all Sides were directed to withdraw. Ordered, That the further Hearing of the said Cause be adjourned till To-morrow; and to be proceeded in exactly at Twelve a Clock. Dominus Cancellarius declaravit præsens Parliamentum continuandum esse usque ad et in diem Martis, vicesimum octavum diem instantis Martii, hora undecima Auroræ, Dominis sic decernentibus. The Answer of Walter Bagenall Esquire, to the Appeal of Edmund Dillon Gentleman, was brought in. E. of Hyndford's Election, Certificate of. "I do hereby certify, that, by virtue of His Majesty's Proclamation of the Twentieth of January 1737, a Certificate under the Hands and Seals of Mr. John Murray and Mr. Thomas Gibson, Clerks of Session attending the Election after mentioned, in virtue of the Lord Register's Commission to them granted, has been delivered into the Crown-office in Chancery; whereby it appears, that John Earl of Hyndford was unanimously elected and chosen to sit and vote in the House of Peers, in this present Parliament, in the room of George Earl of Morton, deceased. Given under my Hand, this 28th Day of March 1738. Hodie 3a vice lecta est Billa, intituled, "An Act for vesting certain Lands and Hereditaments, in the Kingdom of Ireland, Part of the settled Estate of Richard Earl of Burlington and Corke, in Trustees, to be sold, for Payment of Debts; and for settling other Lands and Hereditaments, of greater Value, to the same Uses." Hodie 3a vice lecta est Billa, intituled, "An Act to enable Trustees to grant Building Leases of certain Messuages, in the Parishes of St. Martin in the Fields and St. Clement Danes, in the County of Middlesex, late the Estate of Henry May Esquire, deceased." 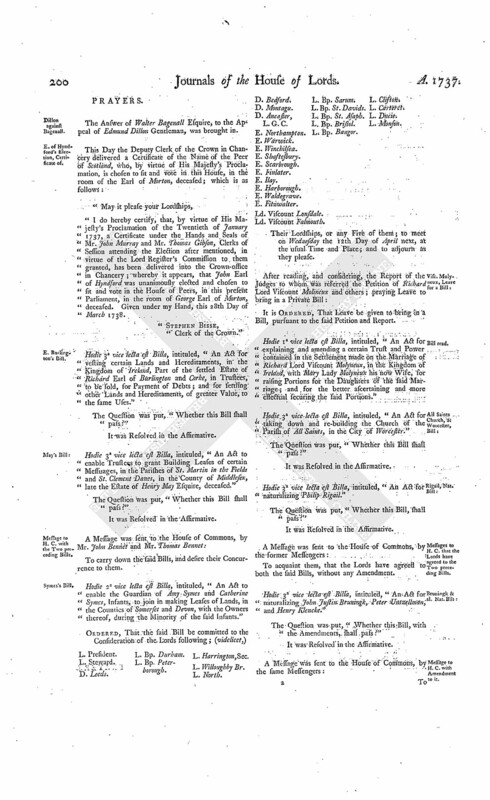 Hodie 2a vice lecta est Billa, intituled, "An Act to enable the Guardian of Amy Symes and Catherine Symes, Infants, to join in making Leases of Lands, in the Counties of Somerset and Devon, with the Owners thereof, during the Minority of the said Infants." Ld. Viscount Falmouth. L. Bp. Durham. L. Bp. Bangor. L. Harrington, Sec. Their Lordships, or any Five of them; to meet on Wednesday the 12th Day of April next, at the usual Time and Place; and to adjourn as they please. Hodie 1a vice lecta est Billa, intituled, "An Act for explaining and amending a certain Trust and Power contained in the Settlement made on the Marriage of Richard Lord Viscount Molyneux, in the Kingdom of Ireland, with Mary Lady Molyneux his now Wife, for raising Portions for the Daughters of the said Marriage; and for the better ascertaining and more effectual securing the said Portions." Hodie 3a vice lecta est Billa, intituled, "An Act for taking down and re-building the Church of the Parish of All Saints, in the City of Worcester." Hodie 3a vice lecta est Billa, intituled, "An Act for naturalizing Philip Rigail." Hodie 3a vice lecta est Billa, intituled, "An Act for naturalizing John Justin Bruningk, Peter Untzellman, and Henry Klencke." Message to H. C. with Amendment to it. The House being moved, "That a Day may be appointed, for hearing the Cause wherein Walter Bagenall Esquire is Appellant, and Edmond Dillon Respondent, et è contra:"
The like Motion and Order, for hearing the Cause wherein Jean Burden Widow is Appellant, and David Smith Respondent, on the next vacant Day for Causes. Ryland against Green & al. Counsel (according to Order) were called in, to be further heard, in the Cause wherein John Earl of Breadalbane and His Majesty's Advocate for Scotland are Appellants, and James Menzies and Angus Mc Donald Respondents. And several more Depositions in the Cause were read. And the Second Counsel for the Appellant the said Earl was heard, to observe thereupon. As was His Majesty's Advocate for Scotland heard, on Behalf of the Crown. Ordered, That the further Hearing of this Cause be adjourned till To-morrow; and that Counsel be called in precisely at Twelve a Clock; and that the Cause appointed for that Day be put off to Monday Sevennight; and the other Causes already appointed to come on to be heard on the next Cause-days in Course. The Earl of Harborough reported from the Lords Committees to whom the Bill, intituled, "An Act to enable Sir Brian Broughton Baronet, an Infant, to enter into Marriage Articles, concerning his intended Wife's Portion, notwithstanding his Infancy," was committed: "That they had considered the said Bill, and examined the Allegations thereof, which were found to be true; that the Parties concerned had given their Consents; and that the Committee had gone through the Bill, and directed him to report the same to the House, without any Amendment." Dominus Cancellarius declaravit præsens Parliamentum continuandum esse usque ad et in diem Mercurii, vicesimum nonum diem instantis Martii, hora undecima Auroræ, Dominis sic decernentibus. E. Hyndford takes the Oaths, &c.
This Day John Earl of Hyndford took the Oaths, and made and subscribed the Declaration, and also took and subscribed the Oath of Abjuration, pursuant to the Statutes. Hodie 3a vice lecta est Billa, intituled, "An Act to enable Sir Brian Broughton Baronet, an Infant, to enter into Marriage Articles, concerning his intended Wife's Portion, notwithstanding his Infancy." Hodie 2a vice lecta est Billa, intituled, "An Act for explaining and amending a certain Trust and Power contained in the Settlement made on the Marriage of Richard Lord Viscount Molyneux of the Kingdom of Ireland with Mary Lady Molyneux his now Wife, for raising Portions for the Daughters of the said Marriage; and for the better ascertaining and more effectual securing the said Portions." L. Viscount Torrington. L. Bp. Sarum. Their Lordships, or any Five of them; to meet on Thursday the 13th Day of April next, at the usual Time and Place; and to adjourn as they please. Kent, &c. against Whitby, in Error. 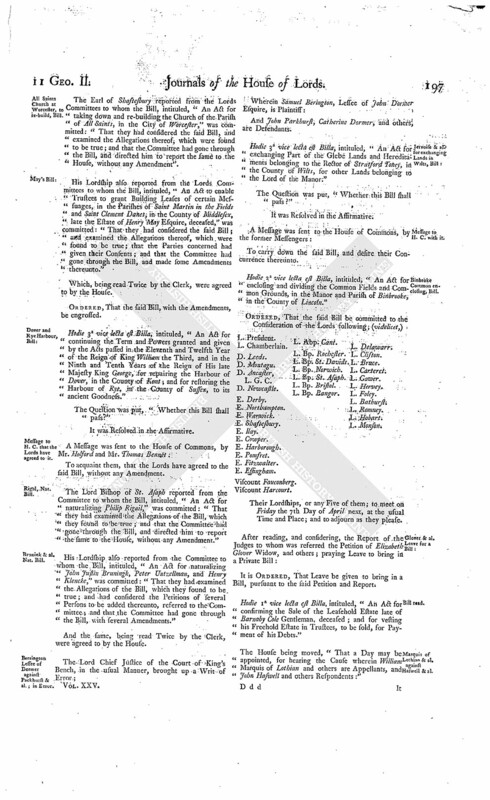 The House being informed, "That Thomas Dalton attended, in order to deliver in a Writ of Error from Ireland:"
"And Robert Whitby and Catherine his Wife Defendants." And having attested upon Oath, at the Bar, "That the said Transcript was a true Copy, he having examined it with the said Record:"
He delivered it to the Clerk; and was directed to withdraw. 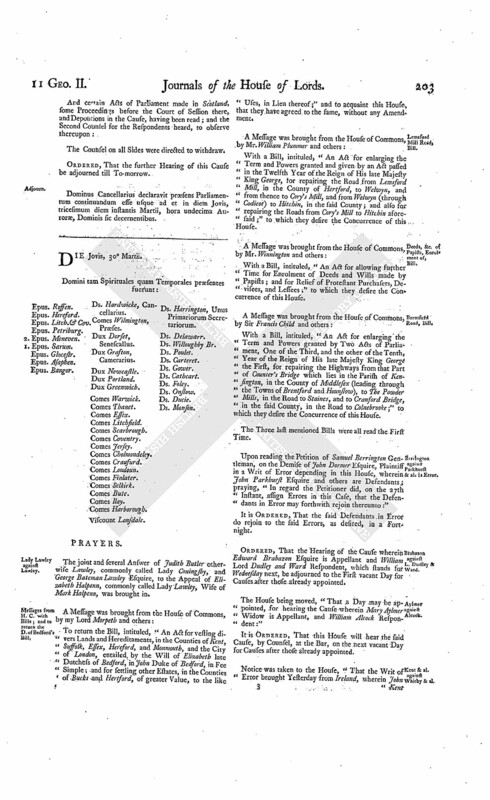 With a Bill, intituled, "An Act to enlarge the Term and Powers granted by an Act of Parliament, made and passed in the Third Year of the Reign of His late Majesty King George, intituled, An Act to enable the Parishioners of the Parish of St. Mary, Rotherith, in the County of Surrey, by certain Funeral Rates therein mentioned, to finish the said Parish Church; and to enable the said Parishioners to raise such further Sums of Money as shall be necessary for purchasing a convenient Piece of Ground, for an additional Burial Ground; and for other Purposes therein mentioned;" to which they desire the Concurrence of this House. With a Bill, intituled, "An Act to enable William Massingberd Esquire, heretofore called William Meux, and the Heirs Male of his Body, to take and use the Surname of Massingberd, pursuant to a Settlement made by Sir William Massingberd Baronet, deceased;" to which they desire the Concurrence of this House. With a Bill, intituled, "An Act for continuing of an Act made in the Sixth Year of the Reign of His present Majesty, intituled, An Act for the better Regulation of Lastage and Ballastage in the River Thames;" to which they desire the Concurrence of this House. 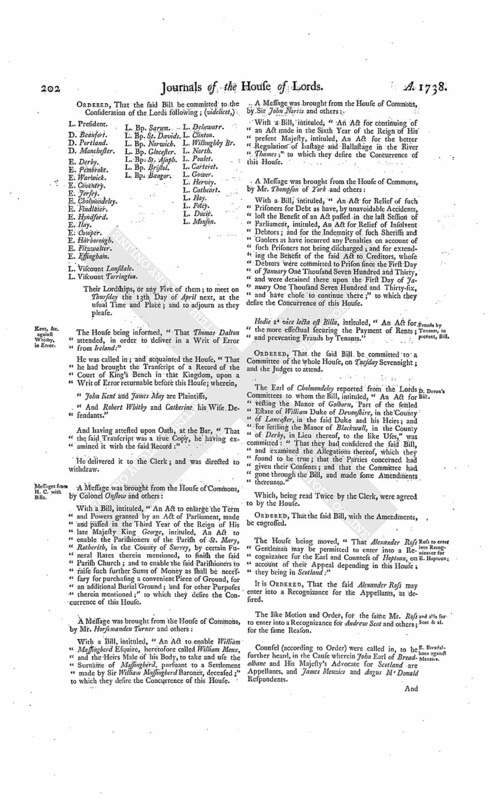 With a Bill, intituled, "An Act for Relief of such Prisoners for Debt as have, by unavoidable Accidents, lost the Benefit of an Act passed in the last Session of Parliament, intituled, An Act for Relief of Insolvent Debtors; and for the Indemnity of such Sheriffs and Gaolers as have incurred any Penalties on account of such Prisoners not being discharged; and for extending the Benefit of the said Act to Creditors, whose Debtors were committed to Prison since the First Day of January One Thousand Seven Hundred and Thirty, and were detained there upon the First Day of January One Thousand Seven Hundred and Thirty-six, and have chose to continue there;" to which they desire the Concurrence of this House. Hodie 2a vice lecta est Billa, intituled, "An Act for the more effectual securing the Payment of Rents; and preventing Frauds by Tenants." Ordered, That the said Bill be committed to a Committee of the whole House, on Tuesday Sevennight; and the Judges to attend. The Earl of Cholmondeley reported from the Lords Committees to whom the Bill, intituled, "An Act for vesting the Manor of Golborn, Part of the settled Estate of William Duke of Devonshire, in the County of Lancaster, in the said Duke and his Heirs; and for settling the Manor of Blackwall, in the County of Derby, in Lieu thereof, to the like Uses," was committed: "That they had considered the said Bill, and examined the Allegations thereof, which they found to be true; that the Parties concerned had given their Consents; and that the Committee had gone through the Bill, and made some Amendments thereunto." The House being moved, "That Alexander Ross Gentleman may be permitted to enter into a Recognizance for the Earl and Countess of Hoptoun, on account of their Appeal depending in this House; they being in Scotland:"
It is Ordered, That the said Alexander Ross may enter into a Recognizance for the Appellants, as desired. and also for Scot & al. The like Motion and Order, for the same Mr. Ross to enter into a Recognizance for Andrew Scot and others; for the same Reason. Dominus Cancellarius declaravit præsens Parliamentum continuandum esse usque ad et in diem Jovis, tricesimum diem instantis Martii, hora undecima Auroræ, Dominis sic decernentibus. The joint and several Answer of Judith Butler otherwise Lawley, commonly called Lady Coningsby, and George Bateman Lawley Esquire, to the Appeal of Elizabeth Halpenn, commonly called Lady Lawley, Wife of Mark Halpenn, was brought in. Messages from H. C. with Bills; and to return the D. of Bedford's Bill. To return the Bill, intituled, "An Act for vesting divers Lands and Hereditaments, in the Counties of Kent, Suffolk, Essex, Hereford, and Monmouth, and the City of London, entailed by the Will of Elizabeth late Dutchess of Bedford, in John Duke of Bedford, in Fee Simple; and for settling other Estates, in the Counties of Bucks and Hertford, of greater Value, to the like Uses, in Lieu thereof;" and to acquaint this House, that they have agreed to the same, without any Amendment. 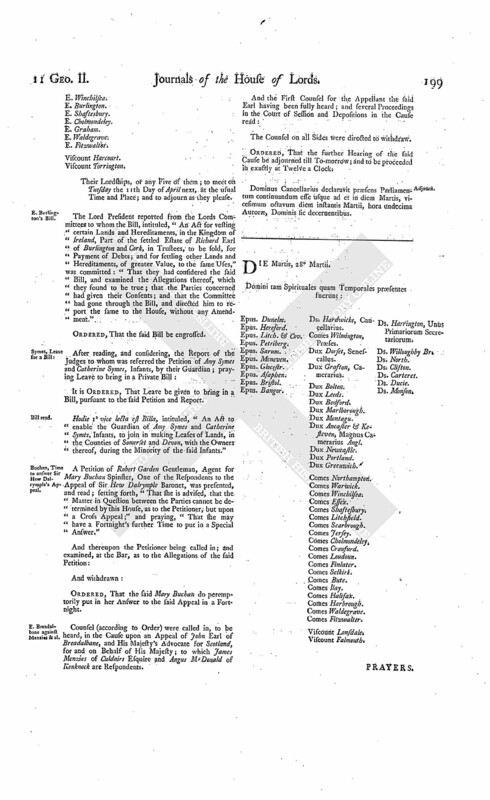 With a Bill, intituled, "An Act for enlarging the Term and Powers granted and given by an Act passed in the Twelfth Year of the Reign of His late Majesty King George, for repairing the Road from Lemsford Mill, in the County of Hertford, to Welwyn, and from thence to Cory's Mill, and from Welwyn (through Codicot) to Hitchin, in the said County; and also for repairing the Roads from Cory's Mill to Hitchin aforesaid;" to which they desire the Concurrence of this House. With a Bill, intituled, "An Act for allowing further Time for Enrolment of Deeds and Wills made by Papists; and for Relief of Protestant Purchasers, Devisees, and Lessees;" to which they desire the Concurrence of this House. 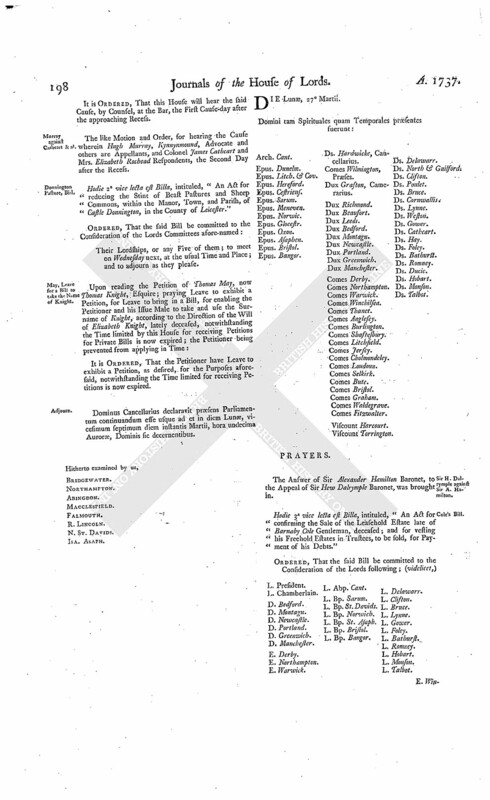 With a Bill, intituled, "An Act for enlarging the Term and Powers granted by Two Acts of Parliament, One of the Third, and the other of the Tenth, Year of the Reign of His late Majesty King George the First, for repairing the Highways from that Part of Counter's Bridge which lies in the Parish of Kensington, in the County of Middlesex (leading through the Towns of Brentford and Hounslow), to The Powder Mills, in the Road to Staines, and to Cranford Bridge, in the said County, in the Road to Colnebrooke;" to which they desire the Concurrence of this House. Berrington against Parkhurst & al. in Error. Upon reading the Petition of Samuel Berrington Gentleman, on the Demise of John Dormer Esquire, Plaintiff in a Writ of Error depending in this House, wherein John Parkhurst Esquire and others are Defendants; praying, "In regard the Petitioner did, on the 27th Instant, assign Errors in this Case, that the Defendants in Error may forthwith rejoin thereunto:"
It is Ordered, That the said Defendants in Error do rejoin to the said Errors, as desired, in a Fortnight. Ordered, That the Hearing of the Cause wherein Edward Brabazon Esquire is Appellant and William Lord Dudley and Ward Respondent, which stands for Wednesday next, be adjourned to the First vacant Day for Causes after those already appointed. The House being moved, "That a Day may be appointed, for hearing the Cause wherein Mary Aylmer Widow is Appellant, and William Alcock Respondent:"
Kent & al. against Whitby & al. 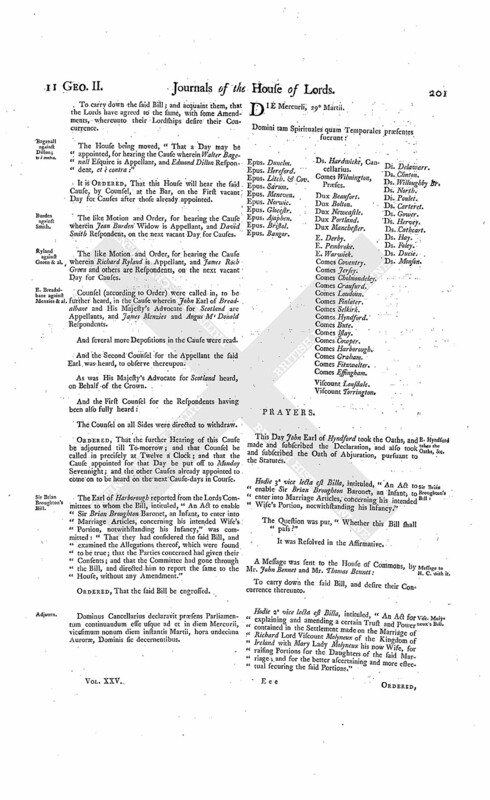 Notice was taken to the House, "That the Writ of Error brought Yesterday from Ireland, wherein John Kent and James May are Plaintiffs, and Robert Whitby and Catherine his Wife Defendants, was returnable before their Lordships, from the Court of King's Bench in that Kingdom, directly hither." It is Declared, That the said Writ of Error is null and void: And it is hereby Ordered, That the same be therefore quashed; and that the Plaintiffs in Error do pay, or cause to be paid, to the Defendants in Error, the Sum of Ten Pounds, for their Costs on this Occasion. "After hearing Counsel, as well on Monday, Tuesday, and Wednesday last, as this Day, upon the Petition and Appeal of John Earl of Breadalbane, and His Majesty's Advocate for Scotland for and in Behalf of His Majesty; complaining of Two Interlocutors of the Lords of Session in Scotland, made the 11th Day of February 1736/7, and 8th Day of July following, on the Behalf of James Menzies of Culdairs Esquire and Angus Macdonald of Kenknock; and praying, "That the same may be reversed; and that the Appellants may have such Relief as to their Lordships, in their great Wisdom, shall seem meet:" As also upon the Answer of James Menzies and Angus Macdonald put in to the said Appeal; and due Consideration had of what was offered on either Side in this Cause: It is Ordered and Adjudged, by the Lords Spiritual and Temporal in Parliament assembled, That the Interlocutors complained of in the said Appeal be, and the same are hereby, reversed: And it is hereby Adjudged and Declared, That the Marches and Boundaries of the Forest of Mamlorn, in Question, are as the same are set forth in the Appellants Action of Declarator, except as is herein after excepted; that is to say, at the South-East, beginning at the Water of Lochay where Altour enters in it, and directly up over the Hill where Altour runs plat North while it come to Lochannaclaklarich, and fra thatfurth plat North-East till the Laich of Corriebane, and fra Corriebane plat North-East to the Burn of Corriechall, and down the Burn of Corriechall while it enter in the Water of Lyon, and up the Water of Lyon to the West End of Loch-lyon; and therefrae plat West as the Loubis of Loch-lyon gangs, and Longeane to Tamchearne, where the Burn of LarigMacphadzie enters in the Burn of Longeane, and up that Burn of Larig-Macphadzie plat South till the Height of Larig-Macphadzie, and from the Height of The Larig plat South while it come into Altchallum, and fra Altchallum into Loquhay, and down Loquhay while the Burn of Altour enters therein, except so far as the Water of Lyon is proved by the Depositions in this Cause to have changed its ancient Course near Loubis; and at that Place, according to such ancient Course of the Water of Lyon; reserving to the Respondents, or either of them, Liberty to insist in this Cause, before the said Lords of Session, on any Right of Servitude that may be competent to them, or either of them, in any Part of the Lands lying within the said Marches and Boundaries of the said Forest, as they, or either of them, shall be advised; and that the said Lords of Session do give all necessary Directions for carrying this Order and Judgement into Execution." Hodie 1a vice lecta est Billa, intituled, "An Act for continuing of an Act, made in the Sixth Year of the Reign of His present Majesty, intituled, An Act for the better Regulation of Lastage and Ballastage in the River Thames." Prisoners for Debt, Relief, Bill. Hodie 1a vice lecta est Billa, intituled, "An Act for Relief of such Prisoners for Debt as have, by unavoidable Accidents, lost the Benefit of an Act passed in the last Session of Parliament, intituled, "An Act for Relief of Insolvent Debtors;" and for the Indemnity of such Sheriffs and Gaolers as have incurred any Penalties on account of such Prisoners not being discharged; and for extending the Benefit of the said Act to Creditors, whose Debtors were committed to Prison since the First Day of January One Thousand Seven Hundred and Thirty, and were detained there upon the First Day of January One Thousand Seven Hundred and Thirty-six, and have chose to continue there." Hodie 1a vice lecta est Billa, intituled, "An Act to enlarge the Term and Powers granted by an Act of Parliament made and passed in the Third Year of the Reign of His late Majesty King George, intituled, An Act to enable the Parishioners of the Parish of St. Mary, Rotherith, in the County of Surrey, by certain Funeral Rates therein mentioned, to finish the said Parish Church; and to enable the said Parishioners to raise such further Sums of Money as shall be necessary for purchasing a convenient Piece of Ground for an additional Burial Ground; and for other Purposes therein mentioned." Massingberd to take the Name of Meux, Bill. Hodie 1a vice lecta est Billa, intituled, "An Act to enable William Massingberd Esquire, heretofore called William Meux, and the Heirs Male of his Body, to take and use the Surname of Massingberd, pursuant to a Settlement made by Sir William Massingberd Baronet, deceased." The Earl of Cholmondeley reported from the Committee to whom the Bill, intituled, "An Act for reducing the Stint of Beast Pastures and Sheep Commons, within the Manor, Town, and Parish, of Castle Donnington, in the County of Leicester," was committed: "That they had considered the said Bill, and examined the Allegations thereof, which were found to be true; that the Parties concerned had given their Consents; and that the Committee had gone through the Bill, and directed him to report the same to the House, without any Amendment." Ordered, That the Committee on the Bill, intituled, An Act for enclosing and dividing the Common Fields and Common Grounds in the Manor and Parish of Binbrooke, in the County of Lincolne," which is to meet To-morrow Sevennight, do meet on the Tuesday following. Dominus Cancellarius declaravit præsens Parliamentum continuandum esse usque ad et in diem Lunæ, decimum diem Aprilis jam prox. sequen. hora undecima Auroræ, Dominis sic decernentibus.